Everybody in the art world knows that, in December, Miami is the place to be. The city hums with the international art market’s particular buzz, as its members cluster around the hive that is Art Basel Miami Beach. But Miami’s artistic heart beats strong the other 11 months of the year too. Pulsing out culinary, literary, theatrical, and architectural bloodlines through winter, spring, summer, and fall. Miami’s cultural scene, in other words, is hot all year round. In January, while New York, London, and Paris freeze, Miami’s golden days shine bright with its world class collections and museums. 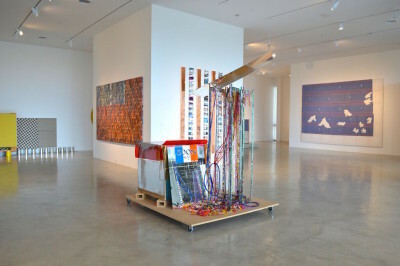 The Margulies Collection, CIFO, PAMM, Girls’ Club, and the De la Cruz Collection, to highlight a few. 45,000 square feet of contemporary art, installation, and photography (Margulies); Latin-American contemporary art in conversation with the global market (CIFO); a museum which is a work of art in and of itself, designed by Herzog & de Meuron (PAMM); the largest collection of contemporary art by women that’s open to the public (Girls’ Club); and a collection that’s moving the discussion of cross-disciplinary art forms to the next level (De la Cruz) – these are just a few of our favorite places to start the year off right. February is for foodies. Culinary big shots and sommeliers from around the world hit up South Beach and surrounding neighborhoods early in the month for the South Beach Food and Wine Festival. Here, food network celebs like Rachel Ray meet alongside local favorites like Zak the Baker and Michelle Bernstein. 2016’s calendar promises you can attend a Wine Spectator Seminar, or catch a tasting called Croquetas and Champagne in honor of the Cuban croquette, hosted by the French New York Chef Jean-Georges Vongerichten. Only in Miami does the sizzle send such international vibes around the town in a single week. And, the best part is that the stovetops keep singing way after the festival’s tents fold up, in restaurants like Bernstein’s Michy’s. March beats to the sound of a conga drum, as Spring spreads across Miami, and we hit Calle Ocho. Miami’s Cuban artery (8th street), particularly between SW 12th and 16th Avenues. Nicknamed Little Havana, you can buy a hand-rolled cigar, or listen to old men talk about days gone by as they conquer a game of dominos at Domino Park (corner of SW14th Street). Right across the street, the Tower Theater plays art house favorites, along with English-language films subtitled in Spanish, and vice versa. For the sweet tooth, try Azucar Ice Cream Company, whose flavors give you a map of Miami: Café con Leche (Cuban Coffee & Oreo); Noche Buena (Spiced Sugar Plum); and Abuela Maria (which among other things tastes like guava and cheese). A walking tour led by Dr. Paul George during Viernes Culturales (cultural Fridays), the last Friday of every month, will highlight the street’s history and “best of.”April is not, as T.S. Eliott suggested, “the cruelest month,” it is, instead, a month full of poetry. Verse springs eternal during O, Miami, a festival that lasts from April 1st through the 30th. 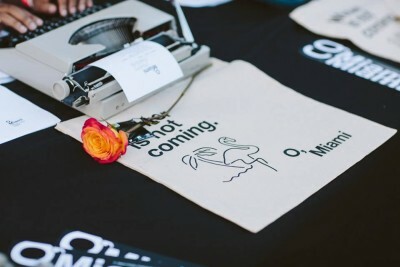 “The goal of the O, Miami Poetry festival is for every single person in Miami-Dade County to encounter a poem during the month of April,” dictates the festival’s mission. In so doing, renowned poets like Kay Ryan and Richard Blanco; Anne Carson and Cambell McGrath descend upon Miami’s streets for events, readings, and pop-ups all around the city. In May head out to the Everglades before it gets too hot – South Florida’s own 1.5 million acre National Park. Known for its manatees, swamplands, and boat tours, the park also has its very own Artists in Residence in Everglades program, or AIRIE. Its mission is to use the cultural arts as a bridge to engage the public with our wilderness. Twice per year, AIRIE has an open house at the AIRIELAB, the live/work space in the Park where fellows stay. These dates are announced on the Facebook page, Artists in Residence in Everglades. They also have a new twitter account: @airieverglades. The summer months of June, July, and August are best for sitting by the water, and getting out into nature. While on the American Riviera, it’s easy to take-in Miami Beach’s Art Deco district, which, according to National Geographic is the first 20th century neighborhood to be on the National Registrar of Historic Places. Post-war design flourishes here, where pink meets a geometric style influenced by everything rom Art Nouveau to the Machine Age. For a change of rhythm on the mainland, there is also Fairchild Tropical Botanic Garden, named after horticulturist Dr. David Fairchild. These grounds are home to tropical plants from around the world from Madagascar to the Middle East. The mission is the conservation of these plants, but that’s not without its fun. Fairchild’s programming has held world-class art exhibitions like that of master glass sculptor Dale Chihuly. In July, the Garden comes alive with the International Mango Festival. In September, as the summer’s lazy days turn to work, take a look at Miami’s artist’s residencies and open studios, which the city is lucky to have in abundance. Start at The Fountainhead Residencies north of Wynwood, in the up and coming Little River area, just north of Little Haiti. Here, you find artists from all over the world, from Mozambique to Brooklyn and Paris, mixed in with Miami natives. Other residencies include Art Center South on Miami Beach, and the Deering Estate Residencies. October is when the season of the arts really kicks off. No better time to become an audience member, as Miami’s theatres lift the red velvet curtains and unveil the first production of their seasons. The Adrienne Arsht Center for the Performing Arts brings large scale Broadway productions to the city, alongside ballet, and opera. It also premieres new work through Zoetic Stage’s acclaimed black box productions at the Carnival Studio Theatre. Other theatres of note include Thinking Cap Theatre @ The Vanguard in Ft. Lauderdale known for its experimental, cutting-edge productions. 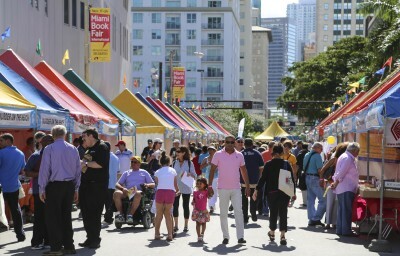 November is a page turner, as the month that hosts the Miami Book Fair. Everybody who is anybody in the world of letters and literature is here during the month of November, attending readings, panels, signings, and tent-fulls of amusement for readers of all ages. Salman Rushdie, Patti Smith, and new literary hot-shots like Marlon James make an appearance and share their newest works. Run by Mitchell Kaplan of Books & Books fame, the book fair has become a staple of the worldwide literary community. So whether your cultural leanings stride toward food, visual art, theatre, the natural world, literature, or inter-cultural relations, Miami is most definitely a place to be and see -- a peacock displaying its brilliant feathers year round.